This is an Icelandic name. The last name is patronymic, not a family name; this person is referred to by the given name Thorfinn. Thorfinn Karlsefni (Old Norse: Þorfinnr karlsefni Þórðarson, Icelandic: Þorfinnur karlsefni Þórðarson) was an Icelandic explorer. Around the year 1010 AD, he followed Leif Eriksson's route to Vinland, in a short-lived attempt to establish a permanent settlement there with his wife Guðríður Víðförla Þorbjarnardóttir and their followers. The byname Karlsefni means "makings of a man" according to the preface of Magnus Magnusson and Hermann Pálsson, although the Cleasby-Vigfusson dictionary glosses it as "a thorough man", elaborated elsewhere as a "real man", a "sterling man". 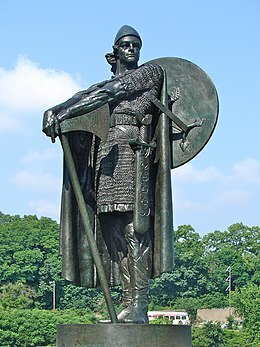 Thorfinn's expeditions are documented in the Grœnlendinga saga ("Saga of the Greenlanders") and Eiríks saga rauða ("Saga of Eirik the Red"),[a] which together are referred to as "The Vinland Sagas", but the details are at considerable variance (See under #Saga sources). Thorfinn Karlsefni met in Greenland Gudrid Thorbjarnardóttir (Guðríðr Þorbjarnardóttir), widow of Thorstein Eiriksson and wedded her. She had been staying under the care of her brother-in-law Leif Eriksson, at Brattahlíð the estate left to Leif by Eirik the Red, who was dead by this point, having succumbed to an epidemic ca. 1003, even though Eir. has him still alive and playing host to her. Thorfinn reached the momentous decision to go to Vinland (ON and Icelandic Vínland), which according to Grl. happened at the insistence of Gudrid. And Leif agreed to lend the houses he built in Vinland, though unwilling to make a free gift of it. Among the other settlers into Vinland was Freydis, the sister or half-sister of Leif Eriksson, who may have accompanied Karlsefni's voyage (Eir.) or headed an expedition of her own that ended in carnage (Grl.). Gudrid bore Thorfinn a boy in Vinland, who was named Snorri, the first child of European descent known to have been born in the New World and to whom many Icelanders can trace their roots. The exact location of Thorfinn's colony is unknown but is believed to potentially be the excavated Norse camp at L'Anse aux Meadows, Newfoundland. It has been pointed out that Eiríks saga rauða (Eir.) distorts the facts by giving undue credit to Thorfinn. For instance, it denies that Thorvald Eiriksson ever led his own voyage to reach Vinland (as Grl. records), even before Thorfinn. Although Thorvald had met his death by Indian arrows in Vinland before Karlsefni embarked, Eir. postponed Thorvald's death so he can be made to accompany Karlsefni to Vinland, ultimately to suffer a more fantastical death from a shot fired by a Uniped. Eir. shifts over to Karlsefni the credit for naming numerous bits of geographic features, from Helluland and Markland to Kjalarnes "Keel Ness", though "this flatly contradicts the Grœnlendinga saga and is assuredly wrong". Helluland (Baffin Island) and Markland were named by Leif; Kjalarness was where Thorvald had wrecked his ship, and the keel was left to stand as a monument, and not an anonymous shipwreck as Eir. puts it. According to the Grœnlendinga saga, Thorfinn Karlsefni's expedition commenced after his marriage to Gudrid Thorbjarnardóttir. This marriage to Gudrid was predicted earlier in the saga by Gudrid's first husband Thorstein Eriksson, upon his death. [c] The expedition brought women and livestock, signifying that they planned on being settled in the area for a while. Along the voyage they ate a beached whale. They also cut timber, harvested grapes, and caught fish and game. A bull they brought frightened the native people (Skraelings). They tried to appease the natives by offering milk, but the natives took ill and battles commenced. Guðríðr Þorbjarnardóttir gave birth to Thorfinn Karlsefini’s son Snorri before they head back to Greenland. Eirik the Red's Saga depicts Thorfinn Karlsefni as a successful merchant from Reynines, Skagafjord, in the north of Iceland. Karlsefni embarks on a trading expedition with forty men, and arrive at Brattahlid, Greenland where they are hosted by Eirik the Red. Karlsefni marries Gudrid that winter. Karlsefni departs with three ships and 140 men in search of Vinland. Karlsefni's expedition winter on a piece of land, where two scouting slaves found grapes and wild grain. Eating a beached whale causes illness, as well as a rift. Thorhall's group declared the whale to be a boon from Thor, offending the Christian members and they part ways. Karlsefni's expedition discovers further south a bountiful area full of wheat, fish, and game. They attempt contact with the natives who travel in hide-covered boats. The natives leave and the Greenlanders winter there, where their livestock flourish. The following spring, the expedition reencounter the natives and engage in trade with them, until a bull breaks free and frightens away the natives. The native return after three weeks with hostile intent, a skirmish ensues, and the Greenlanders attempt as best they can to flee into the forest. Karlsefni and his men are saved by Freydis, who scares the natives off by slapping her bare breast with a sword taken from one of the fallen Greenlanders. The expedition heads back north, and Karlsefni searches for Thorhall in vain. Karlsefni's men encounter the one-legged creature that is said to have shot Thorvald Eiriksson dead with an arrow. Karlsefni's son Snorri is born in the New World. But they eventually leave, and after spending time in Greenland to Eirik the Red, Karlsefni and Gudrid return to Karlsefni's farm at Reynines, in Iceland. Thorfinn Karlsefni's genealogy based on Landnámabók up to Karsefni's father. (For further descendants, see under Snorri Karlsefnisson). Thorfinn Karlsefni's father was Thord Horsehead (Þórðr hesthöfði Snorrason), and his mother was named Thorunn (Þórunn). Thord Horsehead was son of Snorri, son of Thord of Hofdi [is]. Thorfinn was presumably raised at his father's estate called Stad (Stað) in Reyniness (Reynistaður [is]). This estate was located in the Skagafjord bay area, which is also where Thorfinn's great-grandfather established roots, at his farm of Hofdi [is] in Hofdastrand [is]. [d] Thorfinn himself also retired in the area in his later years; while Eiríks saga says "he went (back) to his farm in Reyniness," Grœnlendinga saga states he bought new lands at Glaumby [is]. A more detailed genealogy (under Eiríks saga rauða, ch. 7) is interpolated in the H or Hauksbók text of Haukr Erlendsson. Haukr had particular interest since he himself claimed descent from Thorfinn. However, Haukr's ancestral trace before Karlsefni's great-grandfather Thord of Hofdi deviates from other sources, and the Landnámabók version is deemed more reliably accurate. Though not shown in the family tree (right), Thorfinn also claims descent from the matriarch Aud the Deep-Minded through Thord Gellir. There is also a Japanese manga by Makoto Yukimura showing a fictionalized version of his life: Vinland Saga. ^ Thorstein had succumbed to disease when the couple was heading for a journey trying to recover the body of Thorvald in Vinland. ^ Landnámabók indicates that the great-grandfather Thord of Hofdi had emigrated (from Norway?) to Iceland. ^ In the Hauksbók she is indicated as bearing the same name as her mother Fridgerd. ^ DeCosta 1901, p. 122n: "Enfi" finds its equivalent in the Latin Materia, signifying "Stuff". "Mannsefni" stood for a "promising man," and "Karlsefni" for a "real" or "sterling" man... indicated that the person to whom it was applied was made of "good stuff"
^ Magnusson & Pálsson 1965, Kunz 2001, pp. 626–676 etc. ^ Magnusson & Pálsson 1965, Grl, ch. 7 (p.66), Eir, ch. 12 (p.102), listed as "Snorri Karlsefnisson" in name index. ^ Mitchell, Alana (2002-11-30). "Legend that begins in Newfoundland ends with a 'fantasy' discovery in field" (Reprint). Leif Eriksson Monuments Pages. Retrieved 2008-08-25. Eventually, they settled in what is now Newfoundland, gave birth to Snorri Thorfinnson and stayed for about three years. ^ a b Magnusson & Pálsson 1965, Intro., pp.30-31 "(Haukr Erlendsson) had special interest in Eirik's saga, for he himself was descended from Thorfinn.. he inserted additional genealogical material into the text (Chapters 7 and 14) and made several slight alterations dessinged to add further lustre to his ancestor's fame." ^ Magnusson & Pálsson 1965, Grl., ch. 5 (pp.59-61); Storm 1891, p. 60, "Ch. Þorvalldr for til Vijn lanz"
^ a b For example, Rafn, Carl Christian (1837), Antiqvitates americanæ, Schulzianæ crossreferences "Þórvaldr hryggr Ásleiksson" given by Haukr as Thord of Hofdi's grandfather to "Hróaldr hryggr" given by the Landnámabók. ^ a b c Landnámabók: Ellwood 1898, Part III, Ch. X, pp.136-; Pálsson 2007, §208. Thord (p.93): "Thord, the son of Bjorn Butter-Box, son of Hroald Spine, son of Bjorn Ironside, son of Ragnar Hairy-Breeks.Thord.. took possession of Hofdastrand in Skagafjord.. and made his home at Hofdi...had a third son called Snorri, who married Thorhild the Ptarmigan, daughter of Thord Gellir, and their son was Thord Horse-Head. He married Thorgerd, daughter of Thorir Slouch and Fridgerd, daughter of King Kjarval of Ireland." Magnusson, Magnus; Pálsson, Hermann (1965), The Vinland Sagas, Penguin, ISBN 0-14-044154-9 , with indices for Personal Names and Place Names. Jones, Gwyn (1989) . A history of the Vikings (Open Library). Oxford University Press. p. 300. ISBN 978-0-19-285139-0. James C. Brogan (1889). "Thorfinn" . In Wilson, J. G.; Fiske, J. (eds.). Appletons' Cyclopædia of American Biography. New York: D. Appleton. Chisholm, Hugh, ed. (1911). "Thorfinn Karlsefni" . Encyclopædia Britannica. 26 (11th ed.). Cambridge University Press. This page was last edited on 13 December 2018, at 06:51 (UTC).